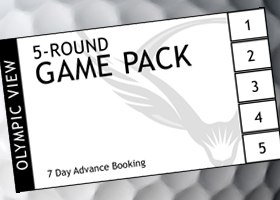 Pre-purchase 5 rounds, and SAVE at Olympic View! The GBC Golf Academy at Olympic View is BC's Premier Golf Learning facility. We combine a world-class practice facility with beautiful surroundings and expert instruction to offer an unparalleled learning experience. The Academy offers a variety of coaching programs, using state of the art technology, designed to help golfers of all ages and skill levels. From private programs to golf schools, our experienced teaching staff is on hand to ensure your time with us is both rewarding and fun. If you want to improve your golf game, the GBC Golf Academy at Olympic View is the place for you. There is only one question - How good do you want to be? Olympic View has a 12-acre practice facility that features large grass decks and comprehensive short game areas. Add to our great facility and world-class instructors, our nationally ranked golf course and you have a recipe for unparalleled learning experiences. We offer a variety of instructional programs and are home to a thriving Junior Academy. At the GBC Golf Academy, we believe that everyone can learn to play better golf and to enjoy his or her game more. In order to help our students, we have developed a program of instruction that is easy to understand and effective for all levels and abilities of golfers. This program is based upon two key concepts; the club needs to do certain things to create a good golf shot and each golfer needs to learn a swing that he or she can repeat. We don’t ask our students to make swings like the pros; we help them learn their best swing based on physical abilities, body type and personal goals. Our instructors have studied the golf swing motion in detail and have been trained to communicate it clearly in a style that can be understood by all golfers. You will learn faster than you ever thought possible. Our goal is to help you to have more fun playing golf. Each golfer has a different perception of fun when it comes to golf. For some this might mean lower scores. For others it might mean playing golf without embarrassment and enjoying the day on the golf course by hitting the ball better. Using state of the art assessment tools your instructor will design an effective coaching program and goal tracking system that will be based upon your individual wants and needs. This will allow us to perform an extensive evaluation of your present golf game, as well as your physical condition and mental skills. The GBC Golf Academy also uses the latest in golf instructional technology. Our video analysis systems combine the best digital video cameras, computers and state of the art software to provide you with the best visual teaching aid on the market today. The GBC Academy at Olympic View also uses the Flightscope Launch Monitor for teaching, fitting and skills assessments. If you are interested in improving your golf game, then we guarantee that we can help you to achieve your goals. The GBC Golf Academy prides itself in being an industry leader. With this mind, all of our instructors must complete a comprehensive in-house training program before ever teaching a single lesson to the public. The program is taught by our senior instructors and includes seminars, watching our experienced instructors teach and helping out during group clinics. The final step before becoming "GBC Certified" involves the candidate giving each of the senior instructors a private lesson. The lesson is critiqued on presentation and knowledge base and each senior instructor then votes on the readiness of the applicant. The professional in question is certified to begin teaching, only when the senior staff is sure the quality of their instruction will meet or exceed the very high GBC Golf Academy standards. The ball dispenser takes one and two dollar coins. NEW: Credit Card payment now available at Practice Facility! We have implemented credit card payment at our Practice Facility for an easier payment option. Bring your credit card and avoid the walk to the golf shop.